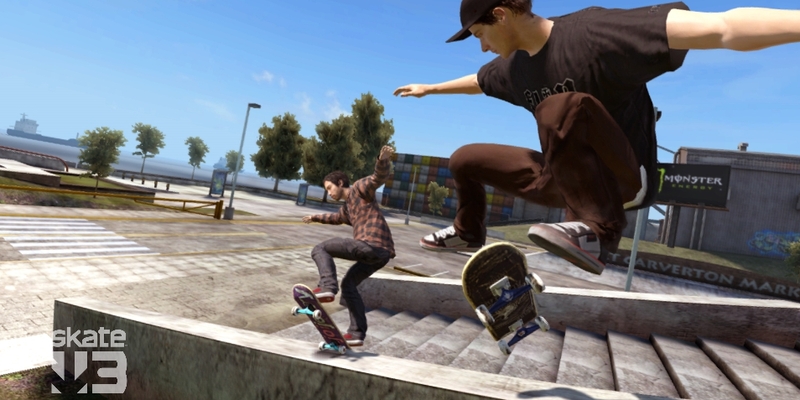 Skate 3 breaks new ground by taking all of the camaraderie and competitive excitement of real-life skateboarding and brings it to the hands of gamers. Whether online or offline, players can now team up to build the ultimate skate crew in the definitive skateboarding co-op experience. In skate 3, players take part in team-based challenges, compete against rival crews and leave their mark on the all-new skater's paradise, Port Carverton. skate 3features an all-new co-op mode where teammates can complete challenges together while advancing each other's careers. From rewarding epic bails and fails with a beefed up Hall of Meat mode to honing your craft with the all-new skate.School, players of all skill levels have multiple ways to "kill it" in the game. The franchise also continues to raise the bar for user created content with the skate.Create feature suite, an innovative toolset that empowers gamers to truly express their skate style by creating their own graphics, videos, and skate parks. Team Up. Throw Down: Work together to take on challenges and progress together through the career campaign or slay all suckers in head-to-head competitive battles for bragging rights. Players can keep tabs on the happenings of their teammates and rivals with Skate. Feed, the all-new game and web social network. New City, More Tricks, More Skate: Say hello to dark slides, under flips, and the all-new skate Mecca, Port Carverton - featuring unique districts, plazas, skate parks and endless lines, this is the true skater's paradise. Build a Brand, Become a Mogul: Form teams and rise up to become a skate industry mogul by selling boards. From completing online challenges to creating skate parks to having your graphics downloaded, almost everything skaters do in the game counts towards their progression. Skate. Create and Share: Returning favorites Skate. Reel and Skate. Graphics are back. The all-new Skate. 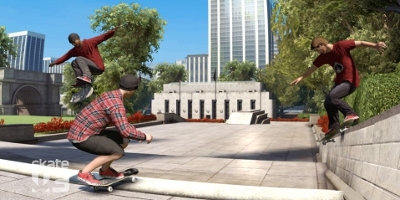 Park is an open canvas for players to create their dream plaza or mega-ramp park. Once created, they can share their masterpieces with the world by uploading them directly from their console. Always Room For Meat: Hall of Meat is back and gnarlier than ever. Gamers can brutalize their skaters in the harshest ways possible with all-new total body control bails. Get ready for carnage that is sure to make players cringe. Zavvi came up trumps in finding this much wanted game from a supplier, short wait. My son loves this game and is addicted to it! This is a great game my son loves it learning now moves he on it all the time i would get this for family members. The skating feels a lot smoother to the first game, it's great to have girl skaters this time, the hall of meat is fun, the locations are pretty too, the challenges are good not too hard and not to easy, it's good to create your own team and to have your own logo pasted everywhere, the death races are bit easier which is good and it's good you can get off your board as well, it's a really cool game. great game, great graphics, great for the kids ! Skate 3 is a very good game, with only minor flaws. Firstly, the positive things about the game include the visuals, the size of gameplay, the easy access to missions (saving you loads of time wandering around) and the re-playability of it. You can go back to all the missions whenever you like to attempt at getting a better score which, personally, is something I love doing. Now the nagging things about it...first off, the trick controls can get a little annoying at times as some tricks have very similar combos. Secondly, the little map in the corner of the screen is a little pointless because it's not an easy map to follow and you've got the option to just go to the pause menu and 'transport' yourself to a certain place. Thirdly, the voice acting is a little dull but this is just being picky I guess. 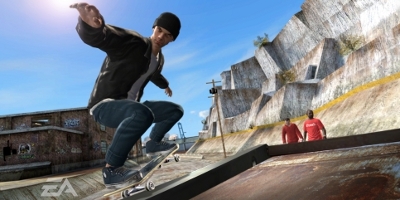 All-in-all, Skate 3 is a great game with great re-playability. I would recommend to anyone who likes skateboarding, but I would recommend it to anyone to be honest because it's a lot of fun. Skate 3 is a great game. This game is very good, just the fun.